Keith Loutit's new website. Famous for his unique miniaturized world. Showcasing his great video works in a simple format. 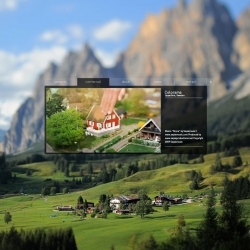 Website by RandomBlowup. Art direction by Jeff Mimery. 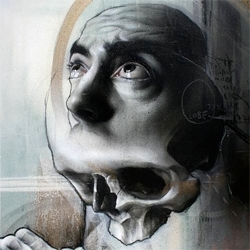 Fantastic exhibition from Troy Gua based on artist collaboration in Seattle . 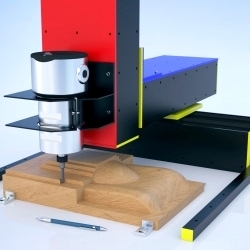 RedBlueCNC is an ECUAD grad project that pushes CNC perception and technology with its modular and open-ended design. 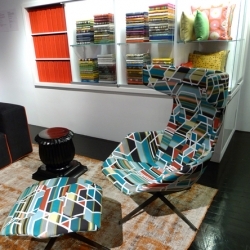 MILANO FUORI SALONE 2010 - new products, including sofas by Colombo and Fukasawa. 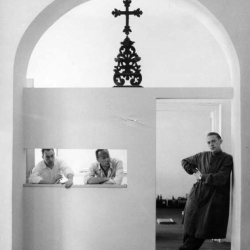 In parallel, ‘Effetto Castiglioni’: for the first time, an exhibition of original models for exhibit designs and architectural projects by Achille Castiglioni. 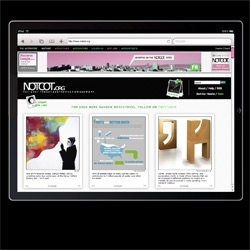 FEATUREDSome of our latest posts here at NOTCOT.org. This week’s picks include stunning architecture and interiors, some playful items and a bit of tech. 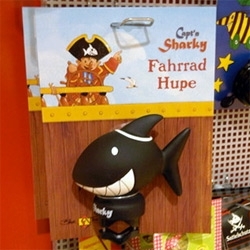 Capt'n Sharky Bike Horn ~ may be for kids, but it'd be pretty adorable on any bike. 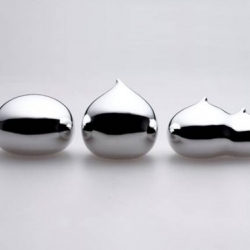 And nice and black and white and squeezable! 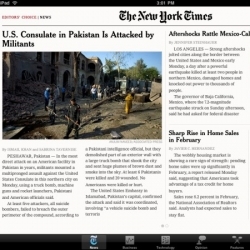 Engadget takes a look at various news iPad apps, where both UI and pricing remain up in the air, raising questions of whether these apps are really better than iPad optimized sites. 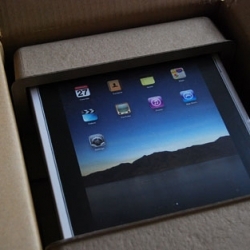 Core77 unboxes the iPad. Great to see every detail for those of us too far away to get our hands on one... yet! 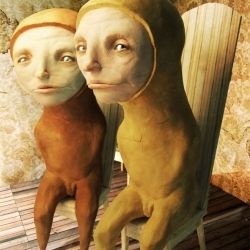 UK artist Andy Hixon uses a combination of photography, sculpture, and digital manipulation to create his unique images and animations. 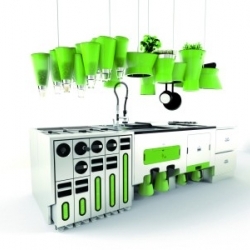 New set of interior products from the contemporary design brand Skitsch which will be launched at this year's Milan show. 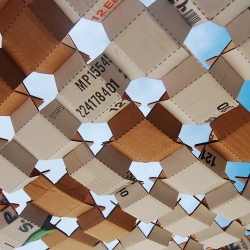 Austin-based designer Daniel Morrison prepares his new piece "Cardboard Sky" for its installation in three weeks. 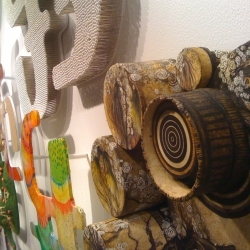 The piece is made up of more than 20,000 unique modules cut from recycled cardboard. They come together to form a huge mosaic. One of my favorite artists, Joshua Petker, will be unveiling some new works soon at the Corey Helford Gallery and I can't wait! 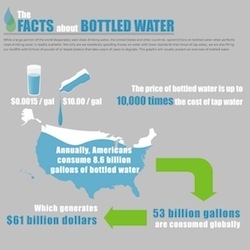 40% of bottled water is really just tap water; it contributes to 3 billion pounds of waste…and other fun stats! 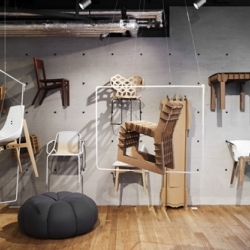 COMA, whose name is taken from comma (the punctuation mark) is made of two modules that can be arranged in different positions by means of a metallic structure covered in wood paneling. 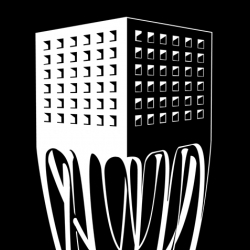 From Sanserif Creatius. 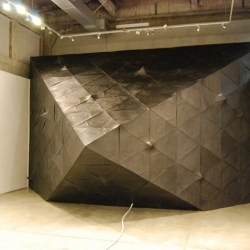 Juan Azulay and SCI-Arc Director Eric Owen Moss present Vivarium at SCI-Arc in Los Angeles, an inverted pyramid for future life-forms. 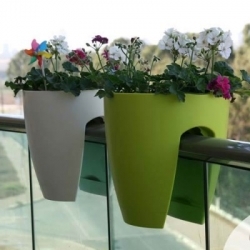 The Greenbo Planter features an innovative design that enables it to be fixed over almost any hand rail. 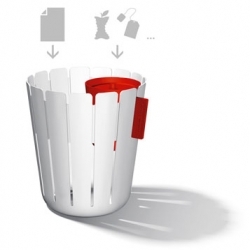 Basketbin by ding3000: separate your compost from your other recyclables with this two-in-one bin. Smaller bin is dishwasher proof. 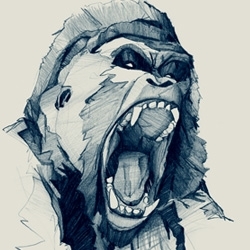 Philipp Zurmöhle is an illustrator and graphic designer from Germany. His work covers experimental nature inspired imagery as well as beautifully clean graphic compostitions. 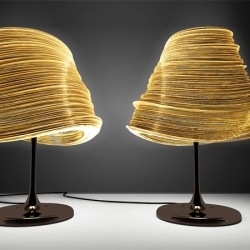 Paper lamp by studio belenko! 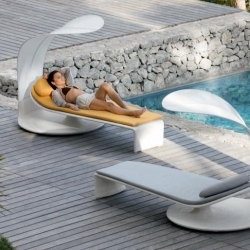 This Summer Cloud lounger, by Eoos for Dedon, features stylish looks and an even better functional design that enables the sun lounger and adjoining shade to be moved either together or independently. 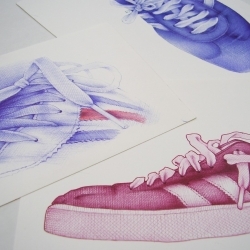 Ballpoint pen drawings of Adidas shoes by British illustrator Andrea Joseph. 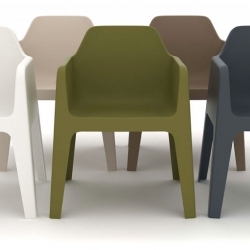 Italian designer Alessandro Busana has designed the new chair PLUS for Pedrali s.p.a.(www.pedrali.it) which will be presented during Milan Design Week 2010. 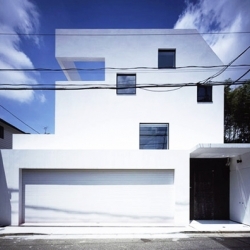 …is the result of an unlikely arithmetic calculation but in this case defines the bases of the project Plus, a search that sees the focal point as the union between character aesthetic and functional from opposites contexts. Simplicity and versatility, typical aspects of the common plastic chair are merged, added, to exclusivity and elegance of the classic lounge chair, creating a new dialogue between aesthetic personality and versatility of use. 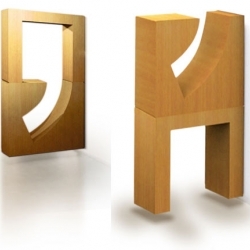 By a conceptual combining between these diametrically opposite two chairs, Plus defines an intermediate point where the balanced cohesion between features such as versatility of use, formal identity and accessibility, have as a direct result the design product represented by the sign +. 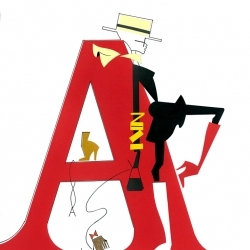 Dutch fashion illustrator Piet Paris is working on a weekly "Fashion Alphabet" for the Amsterdam newspaper Het Parool, together with fashion journalist Georgette Koning. 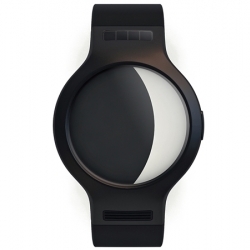 Moonwatch has been designed by The Emotion Lab to establish a relationship between the moon cycle and a person’s emotional states. It’s a new concept of time based on nature. 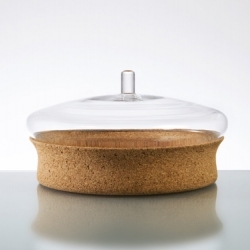 Ekokook by Faltazi is a concept kitchen that takes your waste carbon footprint down near zero through waste sorting, water recycling and compost-maker for organic materials. 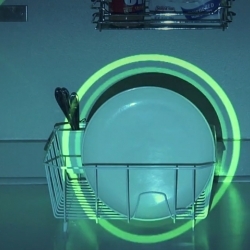 This could well be the future of how we manage our kitchens. 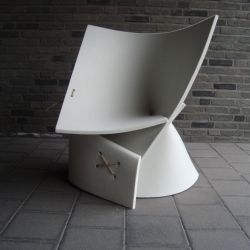 Belgian designers James Van Vossel and Tom de Vrieze have formed a creative cooperation called Fox & Freeze. 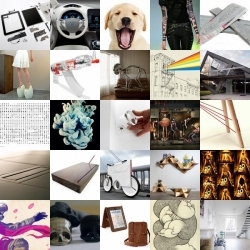 Their first product is the FF1 Chair. 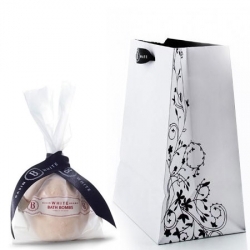 Duffy & Partners designed the packaging for up scale retailer of unique bath and beauty products- Basin White, to appeal to a more affluent and sophisticated audience who appreciate the finer things in life. 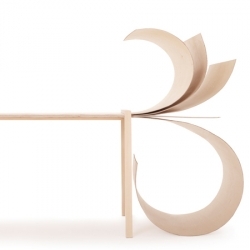 I love this spring table from Stockholm designers Tb & Ajakay. 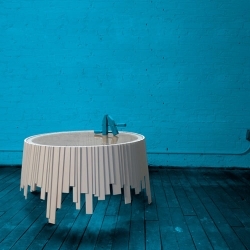 The table is a collaboration with Karl-Johan Hjerling and Karin Widmark to create a table, where layers of the plywood top appear to burst apart and curl around one end. 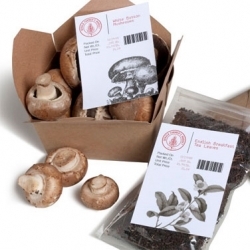 Great packaging for the DeKalb Farmers market by Bert Bacchus. Appaloosa Branch Library designed by DWL Architects. 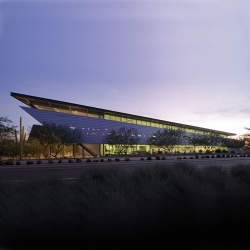 As you approach the library, the building’s metal skin changes colors- from silver-gray to grayish green. Talk about mixing business with leather! 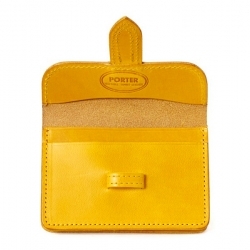 I am not so much into business card carrying accessories, but these veggie tanned card cases from Porter are making me think twice about them. 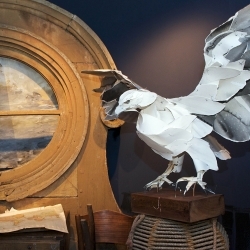 Anthropologie in NYC is featuring Into the Lighthouse, an exhibit designed by Sibella Court that showcases up-and-coming Australian designers and artists. 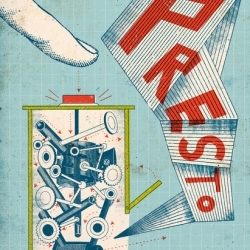 The Beautiful work of Yann Legendre, french illustrator for the covers of Inculte. 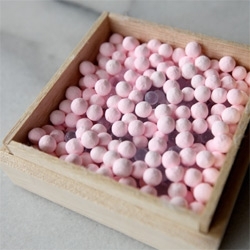 FEATUREDMiya Shinma makes beautiful Perle Parfumée ~ scent designed in Paris, product produced in Japan ~ stunning packaging! 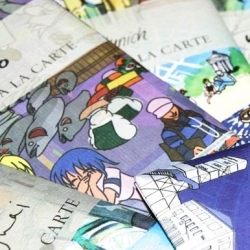 Beautifully hand drawn city maps by Swiss company "A la Carte" with an array of the city’s best kept insider tips. Clinker tables by Rich Brilliant Willing, produced by Innermost, are created from wood slats resembling clapboards, overlapping each other, random lengths create the haphazard form of the tables. Formerly titled: Matryoshka. 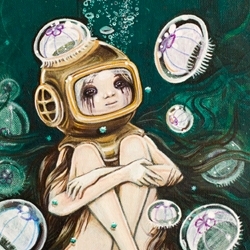 Illustrations by Christian Northeast from Cobourg, Ontario. Christian’s work can be seen in numerous publications including RollingStone, Esquire, GQ, New York magazine, New York Times, Entertainment Weekly, McSweeney’s, etc. 'Visiting' is one of Emmy Lincoln's cute and curious works. 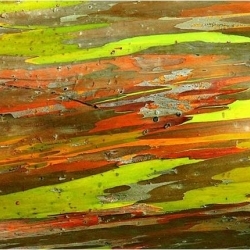 Known as the Rainbow Eucalyptus, this is one amazing (if bizarre) tree. 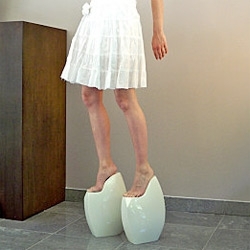 Caroline Sciancalepore is a young french artist. 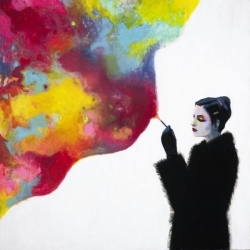 Have a look on her 'support for women', pure and imaginative artwork. 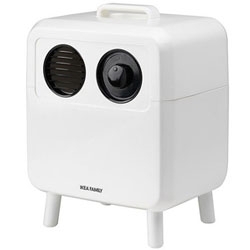 IKEA launches Air Purifier PATRULL that purifies air from pollen, dust, mites, and smoke particles. 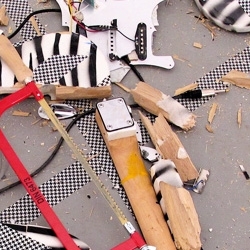 smashed guitars and power tools never looked so good. ghostfuk3r installation at Berlin's East/West gallery. Quick Fixe is a dance party promo, directed by Luke Harris. It is an amazing video which i would love to know how it was done… Check it! 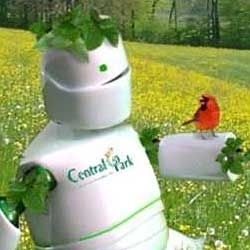 The Plant O Bot was created by Bharoto Yekti as a mascot competition for Central Park in Jakarta, Indonesia.